For many years Burgons grocery store occupied the mock Tudor building on the corner of Causeway Lane and Crown Square (opposite Orme's). Burgons had arrived in Matlock at the beginning of the twentieth century. They had branches throughout the Midlands and in 1912 their Derbyshire branches were at Bakewell, Buxton and in Crown Square. Another business, Burgon and Son, was trading at Norton. Burgons stores used the logo of a black elephant for their own brands and a black elephant symbol can still be seen on the back of the building today. 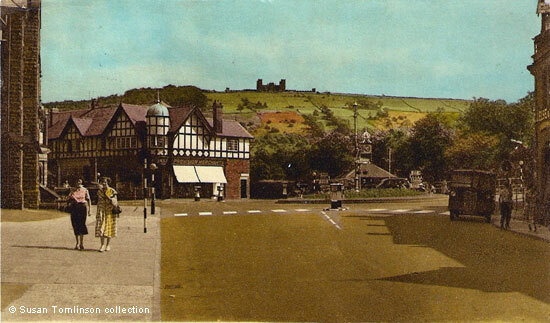 Most of the views of Crown Square have been taken from the bridge looking towards Matlock Bank, whereas this photo was taken from Bakewell Road looking towards Hall Leys Park and the Riber hillside. The small gardens in front of the Crown Hotel seem to have been removed by the time the picture was taken. The painting and decorating firm of C. J. Else & Co. Ltd. was on the opposite side of the road. Zebra crossings had been brought in as a safety measure in October 1951, but it was found that although they were easy to see in the summer, they were not bright enough for the motorists to see on dark and wet nights. The following year a flashing Belisha Beacon was introduced as a warning signal to cut down on the accidents. The zebra crossings on the picture indicate that the original photograph was probably taken about 1952. The pre war lamp post was still in the middle of the traffic island but was about to be replaced. 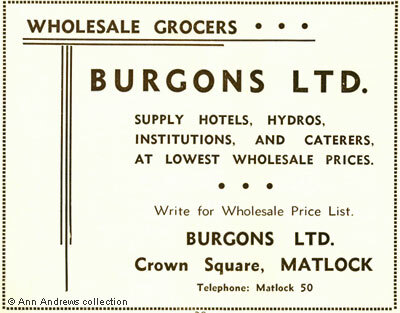 Burgon's did not advertise in Kelly's 1899 Directory, but Burgon's Buildings was listed in an advertisement in 1903.